To assess if carotid calcifications detected in panoramic radiographs are associated with future events of stroke, and/or ischemic heart diseases over 10–13 years in individuals between 60 and 96 years. Baseline (2001–2004) panoramic radiographs were assessed for evidence of carotid calcifications from individuals with no previous history of stroke and/or ischemic heart diseases. A radiopaque nodular mass adjacent to the cervical vertebrae, at or below the intervertebral space C3–C4, was interpreted as carotid calcification. Annual medical records were searched for ICD 10 codes through 2014. Signs of carotid calcification was demonstrated in 238/635 (37.5%) of the study individuals. Signs of carotid calcification was associated with future stroke and/or ischemic heart diseases (χ2 = 9.1, OR 1.6, 95% CI 1.2, 2.2, p < 0.002). In individuals 60–72 years, a significant association between radiographic signs of carotid calcification and stroke and/or ischemic heart diseases (χ2 = 12.4, OR 2.4, 95% CI 1.5, 4.0, p < 0.000) (adjusted for high blood pressure, diabetes type 2, BMI; OR 1.9, 95% CI 1.1, 3.5, p = 0.03). Individuals (60–72 years) with radiographic evidence of carotid calcifications had a mean cumulative stroke and/or ischemic heart diseases survival time of 12.1 years compared to those without such evidence (13.0 years) (log rank Mantel-Cox χ2 = 10.7, p = 0.001). Evidence of carotid calcifications in panoramic radiographs is associated with an event of stroke and/or ischemic heart diseases in 60–96-year-old individuals. Radiographic evidence of carotid calcifications is associated with stroke and/or ischemic heart diseases. Patients with signs of carotid calcifications should therefore be referred for medical examination. Cardiovascular and/or cerebro-vascular diseases have been associated with atherosclerosis which is a consequence of progressive chronic inflammatory conditions . Such diseases cause approximately 30% of human mortality . Data suggest that over a 5-year period, plaque in the arterial vessels changes with decreasing fibrous and lipid tissue composition, and with increasing calcifications through a heterogeneous but slow process . Over time, an increase of carotid intima-media thickness, aortic calcifications, and carotid plaques has been identified as predictors of stroke [4, 5, 6]. Both invasive and noninvasive methods are currently used to assess the presence and extent of arterial calcifications . Intravascular ultrasound and optical coherence tomography are examples of invasive diagnostic methods that may be the most predictable method in identifying an elevated risk for a stroke/cardiovascular event . Doppler sonography (DS), computed tomography (CT), magnetic resonance imaging (MRI), and digital subtraction angiography are examples of noninvasive diagnostic methods to identify carotid calcifications [9, 10]. In dental practice, panoramic radiography is a frequently performed radiographic diagnostic method that can also be utilized to identify carotid artery calcifications when the area of the carotid artery bifurcates is visible [11, 12, 13, 14, 15, 16, 17, 18]. Calcifications in the area of the carotid bifurcation are usually localized posterior and inferior to the mandibular angle adjacent to the space between the third or fourth cervical vertebrae (C3 and C4). Data suggest that calcification identified in panoramic radiographs can be identified in 3–15% of the adult population [11, 19, 20, 21]. A high level of accuracy between signs of carotid calcifications diagnosed in panoramic radiographs and DS findings has been reported . 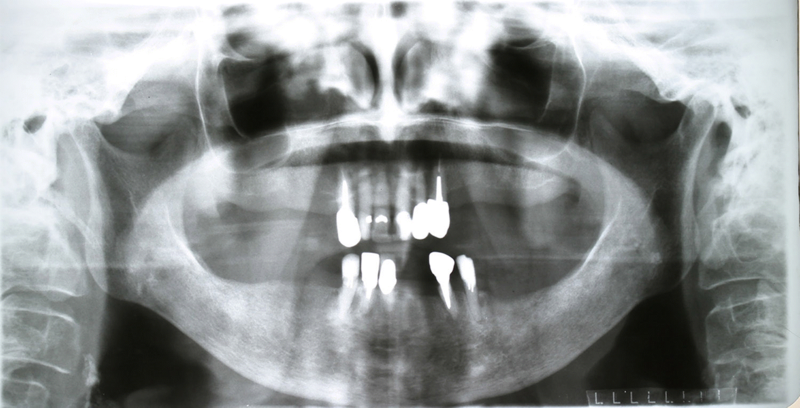 In a recent literature review, we concluded that signs of carotid calcifications are more frequently found in panoramic dental radiographs from older individuals . Few studies have assessed the relationship between radiographic signs of carotid calcifications and future medical events, or studies especially assessing if signs of carotid calcifications are associated with future stroke or ischemic heart disease events [12, 13, 23]. The aim of the present study was to assess if carotid calcifications detected in panoramic radiographs are associated with future events of stroke, and/or ischemic heart diseases over 10–13 years in individuals between 60 and 96 years. The Ethics Committee Lund, Sweden, approved the study (file numbers 604/00 and 744/00). The study was conducted consistent with the principles of the Helsinki declarations. All study participants signed informed consent. The authors had access to the Swedish National Study of Ageingg and Care (SNAC) Blekinge database and take responsibility for the data integrity, and analysis. The data manager ensured the completeness of the research dataset. The enrollment of study individuals occurred between 2001 and 2004 (baseline). The study participants were randomly selected from the Swedish population database from the metropolitan Karlskrona area (The Swedish Tax Agency electronic database). In order to represent the elderly population, individuals between ages 60 and 96 were enrolled. A randomized selection was made from the Swedish civil registration database in the age groups 60, 66, 72, and 78. In the age groups of 81, 84, and 87 (and older), all individuals in the community were invited. Study participants were invited by regular mail. The overall response rate was 62% representing approximately 10% of the entire population ≥ 60 years of age. More individuals in the older age group declined participation compared to individuals in the younger age groups. All study participants were examined by medical and dental research teams at the research center in Karlskrona. Baseline inclusion criteria were as follows: age between 60 and 96 years and living in the county of Karlskrona, Sweden, and with the completion of a comprehensive baseline medical/dental examination. The study protocol required that, at baseline all study participants had a panoramic radiograph taken at the research clinic. Only those individuals with a panoramic radiograph from which the area of interest (the bifurcation area; intervertebral space at or below the C3 and C4 vertebrae) could be assessed. On an annual basis, the medical electronic database through 2014 or until the study individual either was lost to follow-up or had died was used for the collection of medical events. The data collection was focused on information about events of stroke or ischemic heart diseases for the respective year. The medical records of the 726 enrolled study participants were searched for conditions defined by the International Statistical Classification of Diseases and Related Health Problems, 10th revision (ICD-10). At baseline (2001–2004), analogue panoramic radiographs using a standard exposure of 75 kV/10 mA were taken with an Orthopantomograph (OP 100, Instrumentarium, Tuusala, Finland). An example of a panoramic radiograph with the intervertebral space at or below the vertebrae C3–C4 visible and suitable for the assessment of the presence, or absence of a radiopaque nodular mass is presented (Fig. 1). An independent, experienced examiner  from the Department of Oral Medicine, School of Dentistry, University of Washington, Seattle, WA, USA, performed the radiographic measurements, with no information on medical conditions, age, or gender of the study participants. Reliability measurements in assessing evidence of carotid calcifications were performed. Reliability assessments of carotid calcifications were made from two different occasions through intraexaminer assessments of carotid calcification signs from 100 randomly selected panoramic radiographs resulting in a Cronbach’s alpha of 0.91. The interval between the two sets of readings was approximately 1 year. Events of stroke (cerebrovascular diseases) or ischemic heart diseases (cardiovascular diseases) were registered according to the ICD 10 codes: ICD 60–69 for stroke and ICD 20–25 for ischemic heart diseases. This information was collected from the electronic medical database at the research center of the general hospital in Karlskrona, Sweden. Between 2001 and 2014, a physician (JB) reviewed the medical records annually for all individuals in the study. The data were analyzed using descriptive and inferential statistics. Because the data were assumed not to follow a normal distribution pattern, both independent t tests (equal variance not assumed) and nonparametric tests (Mann–Whitney U test) were also performed to assess group differences. Dichotomous data were analyzed using Pearson χ2 test, Mantel–Haenszel odds ratios. The data were also studied by binominal logistic regression. The Kaplan–Meier estimator (log rank Mantel–Cox) was used to study events of stroke and ischemic heart diseases in study individuals with or without radiographic evidence of carotid calcifications during the study period. Statistical significance was set with α at p < 0.05. The IBM SPSS version 23.0 statistical software package (SPSS Inc., Armonk, NY, USA) for Macintosh computer was used in the analyses. Demographic and medical data in 60, 66, 72, and 78 years and older study participants are presented (Table 1). The younger age groups (60, 66, and 72 years) included 350 study participants. The older age groups (78, 81, 84, 87, 90, 93, and 96 years) included 376 study participants. All study participants were Caucasians. During the study period (2001–2014), 66/350 (18.9%) in the younger age group and 285/376 (75.8%) participants in the 78 age group had died. The data on all study participants identified a significant association between carotid calcifications and a future event of stroke and/or ischemic heart diseases (χ2 = 9.1, OR 1.6, 95% CI 1.2, 2.2, p < 0.002). In the younger age group, this association was more pronounced (χ2 = 12.4, OR 2.4, 95% CI 1.5, 4.0, p < 0.000). In the younger age group, there was also a significant association between carotid calcifications and an event of stroke (χ2 = 4.5, OR 2.3, 95% CI 0.9, 6.2, p = 0.03). At the baseline examination, 91 individuals (14.3%) of the total 726 individuals reported a history of stroke and/or ischemic heart diseases. Radiographic signs of carotid calcifications in panoramic radiographs were found in 45/91 (49.5%) of the individuals with a known previous history of stroke and/or ischemic heart disease. The gender distribution of such signs was 13/45 (28.9%) in women and 32/45 (71.1%) in men. The mean age of these 91 individuals at the time of examination was 68 years among 60–72 years and the corresponding figure among 78–96 years was 81.8 years. Data reporting on future events of stroke or separately ischemic heart diseases or a combination of both on the remaining 635 individuals that reported no previous event of stroke and/or ischemic heart diseases are reported in subanalysis. The subanalysis are described in Tables 2, 3, and 4. Medical records between 2001 and 2014 identified events of stroke and/or ischemic heart diseases in 195/635 (30.7%) of these study individuals (Table 1). Men in the 60–72 years age group had a higher odds ratio (OR) for a stroke event than women (OR 3.1, 95% CI 1.0, 8.3, p = 0.02). Statistical analysis, however, failed to demonstrate a gender difference for ischemic heart diseases (OR 1.3, 95% CI 0.7, 2.4, p = 0.4). Data analysis also failed to demonstrate gender differences in the 78 and older age group for the incidence of stroke (OR 1.0, 95% CI 0.6, 1.8, p = 0.9) or for the incidence of ischemic heart diseases (OR 1.4, 95% CI 0.9, 2.4, p = 0.12). A positive finding of carotid calcification was demonstrated in 238/635 (37.5%) of the study individuals. Carotid calcifications were more frequent in the older age group 135/319 (42.3%) as compared to the 60–72 age group 103/316 (32.6%) (χ2 = 6.4, OR 1.5, 95% CI 1.1, 2.1, p = 0.01). Independent of age, radiographic signs of carotid calcifications were more frequently identified in men (χ2 = 11.1, OR 1.8, 95% CI 1.3, 2.5, p = 0.001). In Table 2, data on the associations between signs of carotid calcifications in panoramic radiographs, gender, self-reported high blood pressure at baseline, type 2 diabetes, body mass index (BMI), smoking reported at baseline, and future events of stroke and ischemic heart diseases are presented for individuals without a previous history of the respectively event (stroke, ischemic heart diseases or stroke and/or ischemic heart diseases). The same information but in the 60–72 years is presented in Table 3. Logistic regression analysis of the results identified, in individuals 60–72 years, a significant association between carotid calcifications in panoramic radiographs and stroke and/or ischemic heart diseases, both crude and adjusted for confounders (high blood pressure, type 2 diabetes, BMI) (crude OR 2.4, 95% CI 1.4, 4.1, p = 0.002, and adjusted OR 1.9, 95% CI 1.1, 3.5, p = 0.03). A statistically significant crude association between radiographic evidence of carotid calcifications and a recorded diagnosis of ischemic heart diseases was also found in the younger age group (60–72) (crude OR 2.1, 95% CI 1.2, 3.7, p = 0.01). This association was, however, not statistically significant when adjusted for confounders (high blood pressure, type 2 diabetes, BMI) (adjusted OR 1:7, 95% CI p = 0.07). When individuals 78–96 years were included in the analysis, only a history of high blood pressure was significantly associated with future stroke and/or ischemic heart diseases (Table 4). We did not have data on cause of death available for analysis. It should, however, be highlighted that when analyzing radiographic signs of carotid calcifications among those who had died during the course of the study, 47.0% had positive signs of carotid calcifications compared to 31.2% in the material that were survivors. The OR of death before the endpoint of the study presenting with signs of carotid calcifications at baseline was 2.0 (95% CI 1.4, 2.7, p < 0.001). 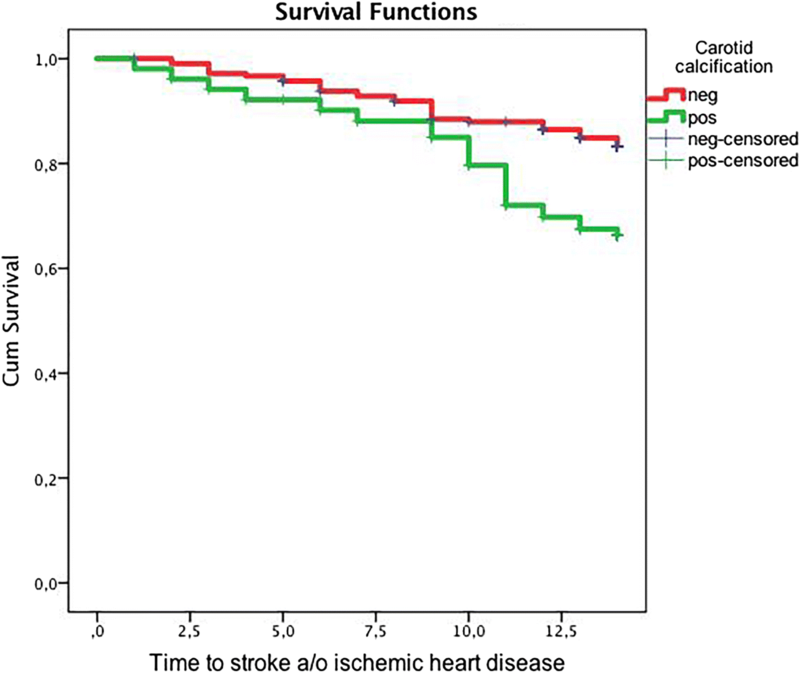 Relationships between a positive/negative sign of carotid calcification and cumulative events of a first event of stroke and/or a first event of ischemic heart diseases were illustrated by Kaplan–Meier survival analysis (Figs. 2 and 3). Study participants (60–72 years) with baseline radiographic evidence of carotid calcification and no previous history of an event had a mean cumulative stroke and/or ischemic heart diseases survival time of 12.1 years compared to those without such evidence (mean cumulative survival time 13.0 years) (log rank Mantel–Cox χ2 = 10.7, p = 0.001). 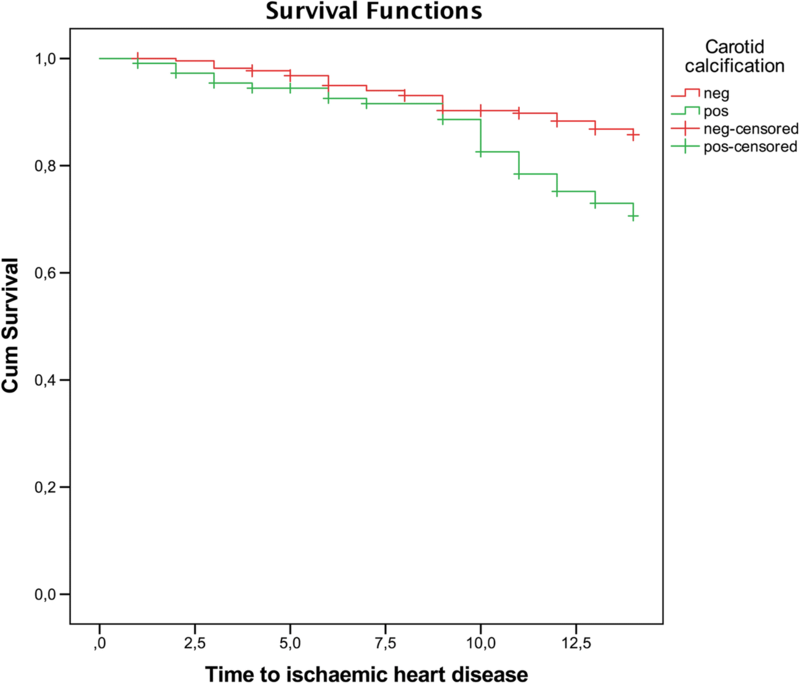 Individuals (60–72 years) with baseline radiographic evidence of carotid calcifications, and no history of an ischemic event, had a mean cumulative ischemic heart diseases survival time 12.5 years compared to those without such evidence (mean survival time was 13.2 years) (log rank Mantel–Cox χ2 = 9.5, p = 0.002). The present long-term follow-up study demonstrated that in individuals between 60 and 72 years, radiographic signs of carotid calcifications were found in panoramic radiographs and associated with future events of stroke and/or ischemic heart diseases. The frequency of stroke and ischemic heart diseases also increased with age. The associations between carotid calcifications stroke and/or ischemic heart diseases or ischemic heart diseases alone were, however, not significant in the old age group (78–96 years). It is possible that several of the individuals in the older age group died from events of stroke and/or ischemic heart diseases. The number of stroke and/or ischemic heart diseases may therefore be underestimated especially in the older age group with the highest mortality rate. Characteristics of the study participants (i.e., age, gender, BMI, hypertension, type 2 diabetes mellitus) in the present study (Table 1) suggested that many of the study participants presented with conditions partly explanatory to future risks of stroke and/or ischemic heart diseases. In the 60–72-year age group, a significant association between radiographic evidence of carotid calcifications and an event of stroke, and/or ischemic heart diseases also remained when adjusted for confounders (high blood pressure, type 2 diabetes, and BMI). Several studies have previously demonstrated an association between carotid calcifications observed in panoramic radiographs and a history of stroke [11, 15, 18, 20, 25, 26]. There are few prospective studies that have examined if carotid calcifications detected in panoramic radiographs are associated with future diagnostic events of stroke and/or ischemic heart diseases [6, 13, 23]. To our best knowledge, the present study is the first study that has a long-time (> 10 years) follow-up period of cases ≥ 60 years of age with/without radiographic signs of carotid calcifications investigating medically diagnosed future stroke and/or ischemic heart diseases. In two reports with a follow-up period of approximately 3 years, it was demonstrated that male veterans > 55 years with signs of carotid calcifications identified in panoramic radiographs had a higher OR of events of myocardial infarction, stroke, TIA, revascularization, and angina than those without such signs [13, 23]. Our data are also in accordance with a recent study over 5 years demonstrating that individuals with carotid calcifications in panoramic radiographs had a higher risk of future vascular events compared to controls . The frequency of carotid calcifications in the present study is high. This is in agreement with previous reports and literature reviews demonstrating frequent findings of radiographic signs of carotid calcifications in older individuals [14, 15, 20, 21]. 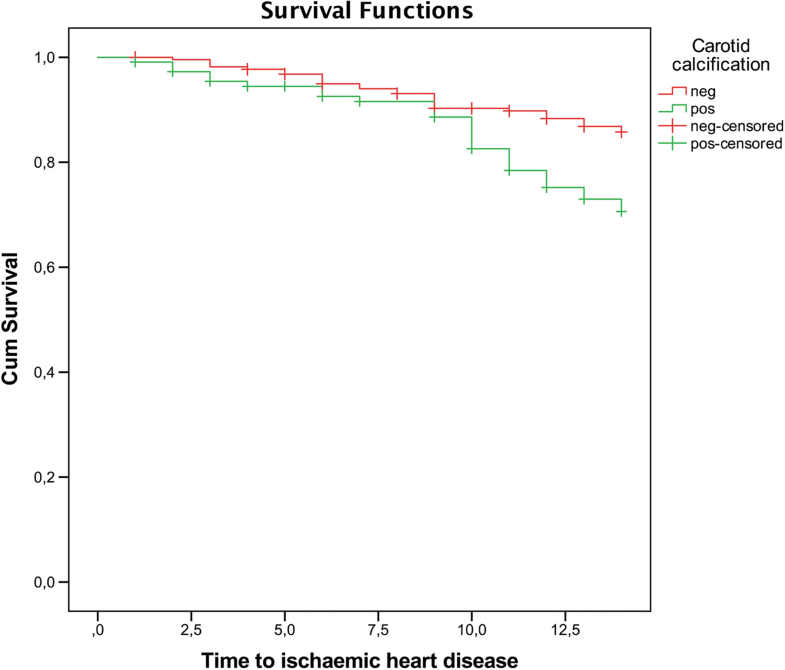 The present study identified a lower mean cumulative stroke and/or ischemic heart disease survival time, and a lower mean cumulative ischemic heart disease survival time, among individuals with a positive radiographic finding of carotid calcification. The survival time difference in comparison to those without such evidence of carotid calcifications in panoramic radiography was approximately 1 year, which must be considered clinically significant. One shortcoming in the present study was that we were unable to search the records for the reasons of death among our study participants. The observation that the mortality rate for individuals with radiographic evidence of carotid calcifications was much higher than among individuals alive at the study endpoint is important. Information about cause of mortality could have contributed to a better understanding of the relationships between positive findings of carotid calcifications in panoramic radiographs and future events of stroke and/or ischemic heart diseases. However, among the 351 individuals that died during the course of the study, a diagnosis of stroke and/or ischemic heart diseases occurred in 155 individuals. In the remaining 196 individuals, carotid calcification was detected in 46.4%. To obtain panoramic radiographs suitable for the detection of carotid calcifications, it is important that the patient is placed in a correct position when the radiograph is taken. Otherwise, many cases may not be identified. Furthermore, atherosclerotic plaques can be either calcified or noncalcified , which is a limitation with a radiographic method of detection. Thus, the present study results are only based on radiographic findings suggesting the presence of calcified plaque. It is also possible that both positive and negative findings in panoramic radiographs may be misinterpreted by the examiner resulting in either a false positive or negative score. There is a risk for misinterpreting images similar to carotid calcifications representing, i.e., the hyoid bone, the epiglottis, calcified ligaments (stylomandibular and stylohoid), sialoliths, phleboliths, and calcified lymph nodes) [27, 28, 29]. To minimize this risk, it is important that the examiner of the radiographs has good knowledge of the anatomical structures and pathological conditions. In the present study, the examiner had a high degree of agreement between repeated readings of panoramic radiographs. In the present study, only radiographs exposed at baseline were analyzed. Therefore, any new development of carotid calcifications during the course of study prior to a possible event would not have been recorded resulting in an underestimation of the association between carotid calcifications and recorded events of stroke and/or other ischemic heart diseases. In dentistry, panoramic radiography is a common procedure performed to detect signs of oral diseases. Several studies have identified that it is possible to detect signs of carotid calcifications from such radiographs given that the region of interest is exposed. Radiographs, exposed for dental reasons, can be assessed for carotid calcifications. In order to evaluate panoramic radiographs for possible signs of carotid calcification, the dentist should be familiar with the anatomy of the region. It is also advisable to receive training by a radiologist to avoid potential misinterpretations. If a radiographic sign of carotid calcification is identified in a panoramic radiograph, the dentist should first consider other risk factors associated with stroke and ischemic heart diseases. It may also be advantageous to discuss the situation with a physician before a referral for further medical evaluation. Dental students should be given training in identifying radiographic signs in the area of interest. 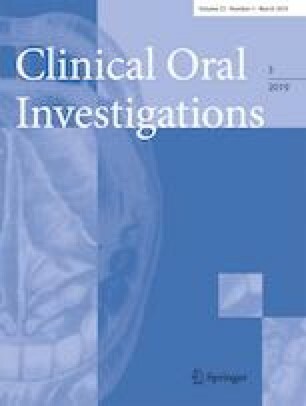 In conclusion, data from the present study demonstrated that signs of carotid calcifications in panoramic radiographs are associated with future events of stroke and/or ischemic heart diseases, or ischemic heart diseases alone in older individuals and especially among individuals 60–72 years. The Ministry of Health and Social Affairs in Sweden and the participating county councils, municipalities and university departments supported the Swedish National study on Aging and Care (SNAC) (www. snac.org). We are grateful to the participants, and the participating counties and municipalities. We also acknowledge the contribution by Research Associate Professor Rigmor Persson (REP), University of Washington who assessed the radiographs. We also want to acknowledge Ms. Ingrid Jonasson, Blekinge Institute of Technology, Karlskrona, Sweden, who collected the clinical dental data, and Ms. Johanna Renvert, University of Kristianstad, for data management. This study was accomplished within the context of the “Swedish National Graduate School for Competitive Science on Aging and Health” (SWEAH) and funded by the Swedish Research Council. The Swedish National Study on Ageing and Care, SNAC (www.snac.org), is financially supported by the ministry of Health and Social Affairs, Sweden, and the participating county councils, municipalities, and university departments. All procedures performed in the study, involving human participants, were in accordance with the ethical standards of the regional research ethics committee and with the 1964 Helsinki declaration and its later amendments.